It comes with: (1)The Frog Dune Buggy Car (1)The Lunchbox Monster Truck (1)Bud Light Hydro Boat (1) Futaba Box Transmitter (1) Futaba Magnum Junior Pistol Grip Transmitter w/Charger (1) New In Box Pro/Tech Super Charger (1) used Pro/Tech Super Charger This also comes with many extras like: snow skis, servos, Reciever, speed control. I have had these stored for many years and have not tried any of them out. If you have any questions please feel free to contact me. All 3 of these R/C vehicles will need some TLC before they will be operational. They are all in need of care. In addition there are 2 or 3 pairs of frequency chips for the Transmitters and Recievers. The other vehicle is the base of the Lunchbox. It is just pieced together and is not all there. I'm writing this just to inform you all so there is no miss communication. 20 years ago I had alot of fun with these. About 10 years ago was the last time I used them. The motors will need to be oiled. There will be electrical work to do. All of these have been well used. The boat has been in a crash but i fixed it and the last time I used it it worked great. After that time I put a new motor on it and never wired it back together. I'm assuming the 5 battery packs are probably not good. S please feel free to contact me. The item "R/C Remote Control Car Truck Boat Lunchbox Frog Bud Light Hydro Transmitters LOT" is in sale since Thursday, March 03, 2016. 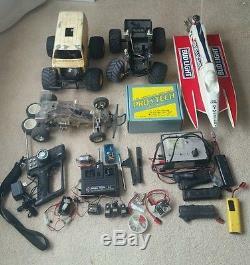 This item is in the category "Toys & Hobbies\Radio Control & Control Line\RC Engines, Parts & Accs\Cars, Trucks & Motorcycles". The seller is "jmaze42" and is located in Rochester, New York. This item can be shipped to United States.